Roman Classicism/ / Jeffersonian Classicism / Classic(al) Revival American Neoclassical substyle inspired by Andrea Palladio's books. Thomas Jefferson owned three copies of Palladio's books and used Palladian ideals in designing Monticello, etc. Beaux-Arts Classicism A very rich, lavish and heavily ornamented classical style taught at L'Ecole des Beaux Arts in Paris in the 19th century. Influenced the last phase of Neoclassicism in the United States. The Neoclassical style, which drew its inspiration from Greek, Roman and Renaissance sources, was a dominant style for domestic architecture throughout the country during the close of the nineteenth-century and well into the twentieth- century. During this period, many of the nation’s architects were being trained at the Ecole des Beaux Arts in Paris or in the offices of those architects who had studied at the school, where the aesthetic value of the Classical vocabulary of form was promoted. The style was introduced to the United States in large part through the architecture and design of the World’s Columbian Exposition in Chicago of 1893, which helped to disseminate the ideals of the Classical vocabulary of form, stark white coloration and monumental scale. The architecture of the Fair also promoted more historic “American” styles such as the Georgian, Federal, Greek Revival and others, thus incorporating elements from these traditions into the more eclectic Neoclassical mode. The Neoclassical style had two general waves of popularity. The initial phase of the style lasted from roughly 1900 until 1920 and emphasized hipped roofs and elaborate, but academically accurate, columns and orders. Between approximately 1920 to the 1950s, the style’s second phase emphasized side- gabled roofs and simplified, more slender columns. During this later phase the Neoclassical style was still prevalent, but has lost much of its popularity to more eclectic styles. While the Neoclassical style is found in some larger scaled residential projects, by far the most common application of the style was for public and commercial buildings. Commonly, the Neoclassical mode emphasized and elaborated the porch, cornices, doorways and windows in its general decoration. Earliest examples of the styles prior to the 1920s typically have more ornate columns which are typically of the Ionic or Corinthian order. Typically, these columns supported a two-story or full-height porch. 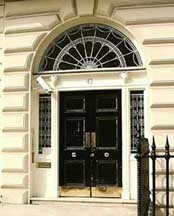 Doorways were generally elaborated with detailed, decorative surrounds based on Greek Revival, Federal or Georgian models and featured elements such as pediments, pilasters, sidelights and fluted or paneled details. A Neoclassical building generally features a boxed eave with a moderate overhand, often with dentils or modillions beneath. Occasionally a wide frieze band in employed. Another characteristic of the style were rectangular double- hung sash windows, generally with six or nine panes per sash. Bay windows, paired windows, transomed windows and arched windows were also utilized for the style, differentiating it from earlier Greek Revival or Early Classical Revival styles.